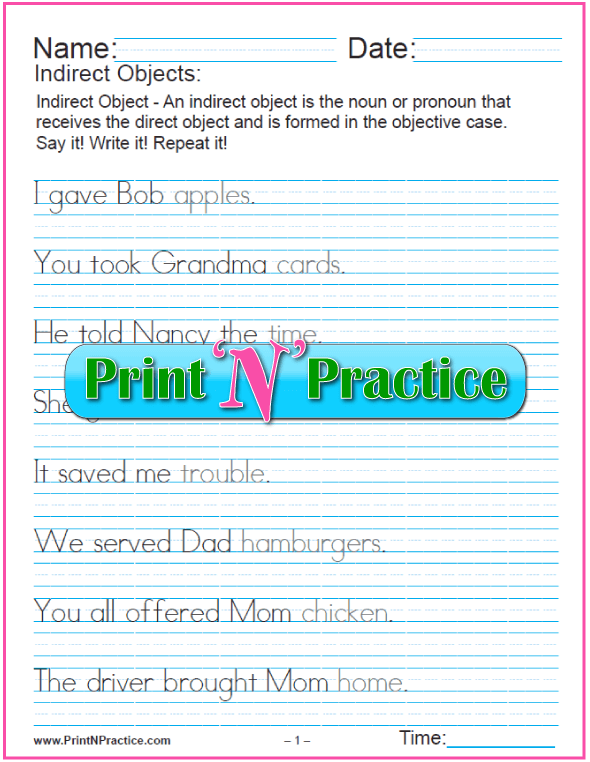 Direct and indirect objects are easier to recognize with our printable grammar worksheets. 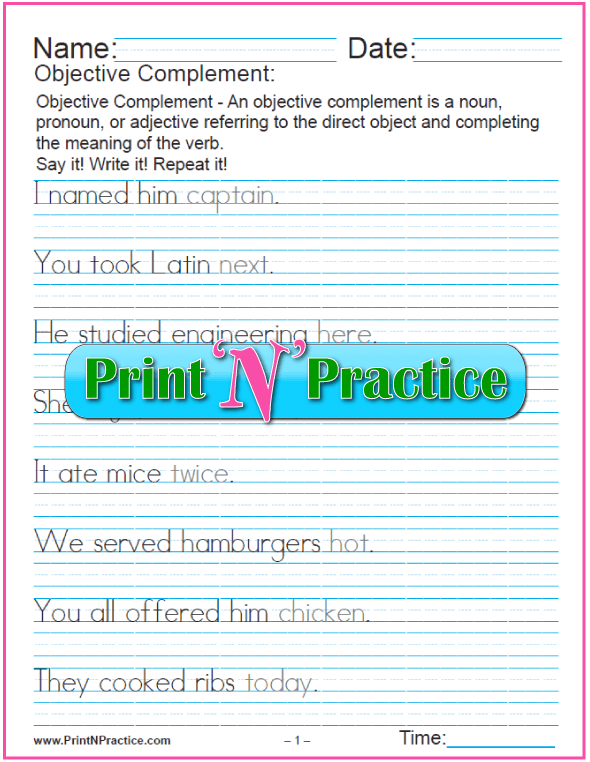 We have several objective case worksheets all together on this page as with the objective complement and objective pronouns. It's actually pretty easy to tell when words are direct objects. 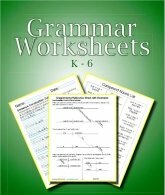 Children in 4th and 5th grade are usually ready to begin to understand the grammar of objects. Practice is the key to seeing the function of the object as the receiver of the action. Nouns, pronouns, and the possessive and relative adjectives (which are part pronoun) have case, either nominative, objective, or possessive. 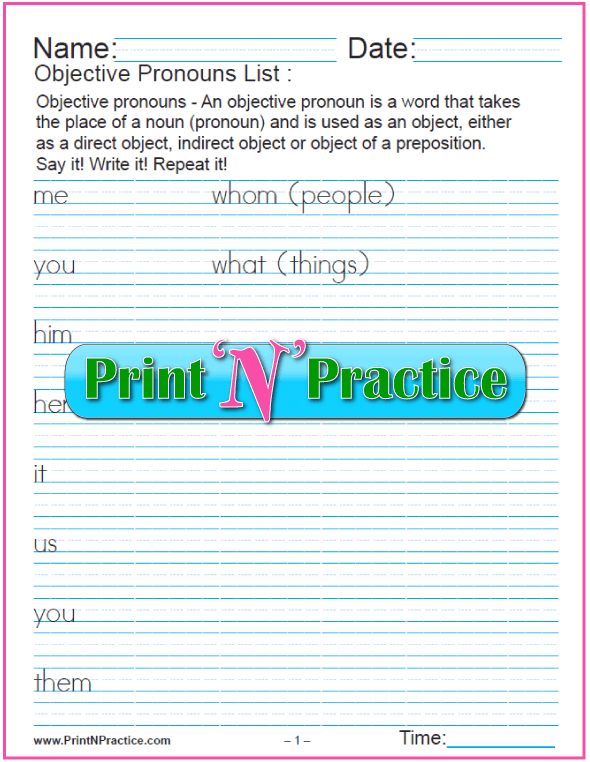 Our objective case worksheets cover object pronouns, too. 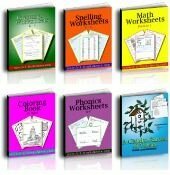 See more instruction below our object worksheets and order all our printable grammar worksheets in one download here. First let's see some definitions. Object - An object is a word, or a group of words, that completes the meaning of the verb in a sentence, an object does not do the action. In the sentence, "Girls learn sewing." the word "sewing" is needed to complete the predicate "learn". Those verbs that require the addition of an object to complete their meaning are called transitive verbs. Any object pronoun must be put in the objective case. "Thomas taught him." See examples below and on our worksheets. Direct Object - is the noun or pronoun that receives the action of a transitive verb in the ACTIVE voice and is formed in the objective case. A bird caught the bug. "Bug" is the direct object of "caught". Indirect Object - is the noun or pronoun that receives the direct object and is formed in the objective case. Bob brought Sue a book. "Sue" receives the direct object "book". The definition of a direct object is on the worksheet and the DO itself is highlighted in gray. 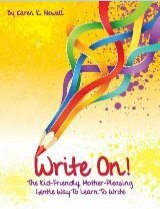 Have the children practice writing the complete sentences with a capital letter on the first word and a period at the end. 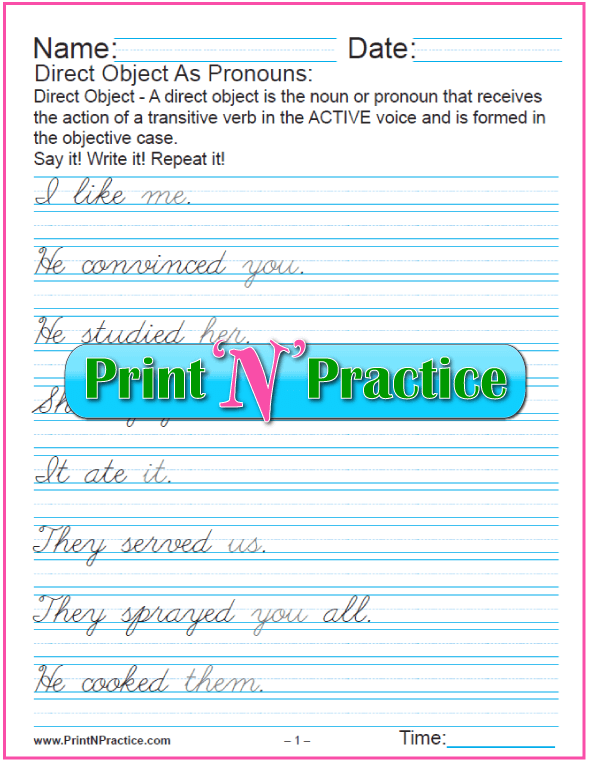 The same for the indirect object worksheets below the direct in the next section. 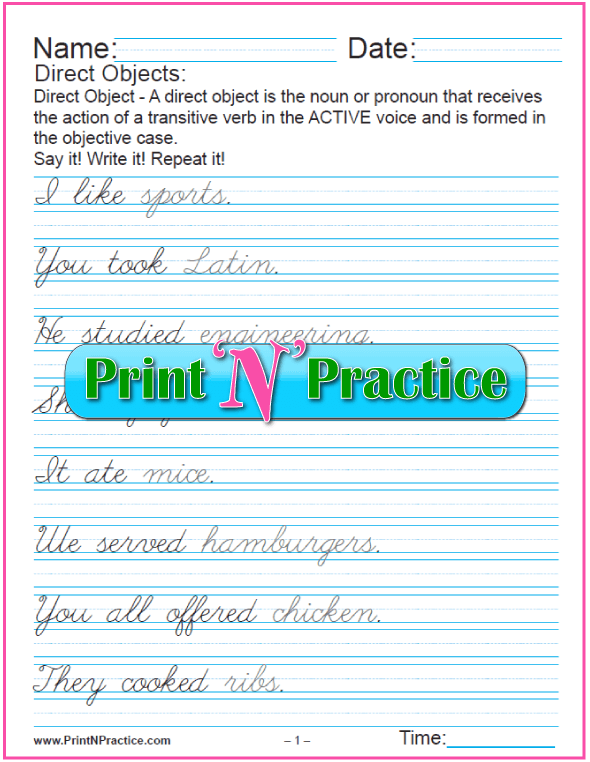 Printable Direct Object Worksheet showing examples. 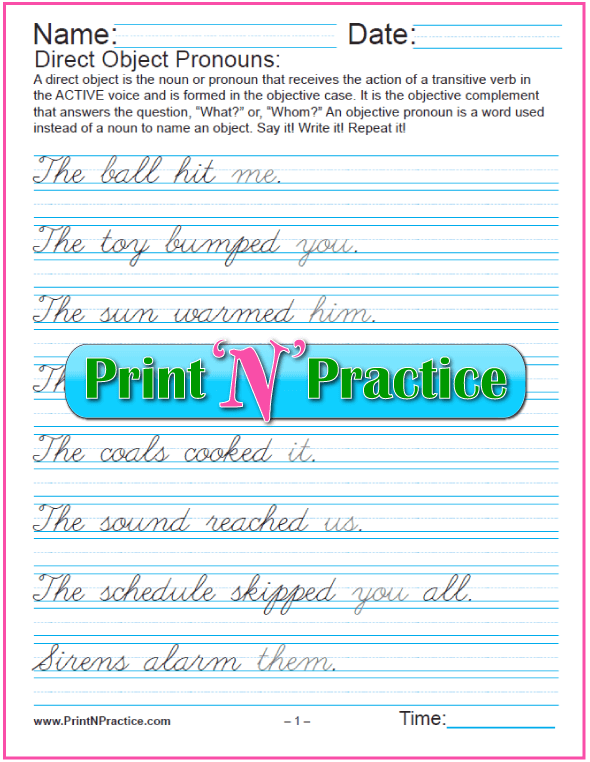 Cursive Direct Object Worksheet showing examples. Because pronouns take the place of nouns, they can be used as objects meaning that they are object pronouns. 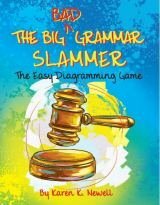 They, their, theirs, and them are plural neuter personal pronouns. Simply change the y of "they" to i or m if you are speaking of people or things. Here, there, where, and everywhere are pronouns of place and can be used as objects. 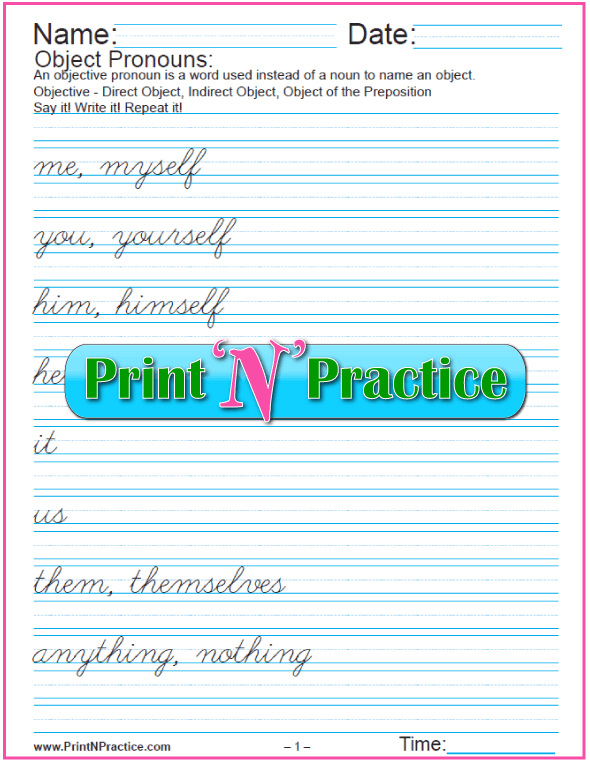 See more about Object Pronouns on our Pronoun Worksheets page here. 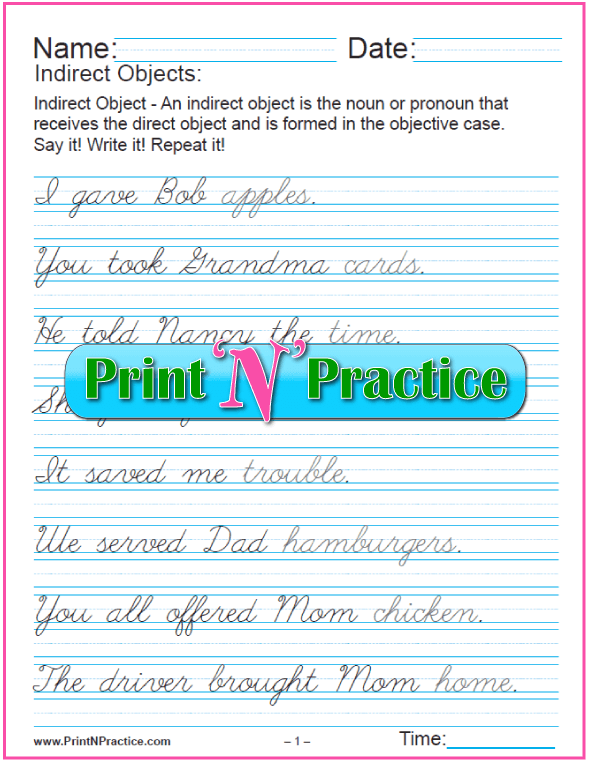 These can be used as objects of prepositions, as well as direct and indirect objects. 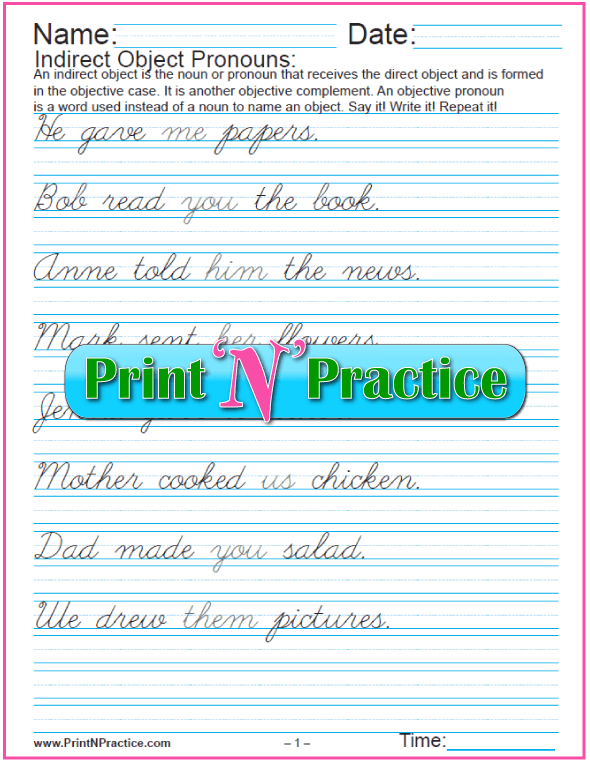 Case is the form of a noun or pronoun that indicates its sense relation to other words in a sentence. Be sure to see our diagramming worksheets to see where objects sit on the chart. The nominative case shows that the word is either the subject or the predicate complement, the noun or pronoun that completes the predicate verb by answering the question, "What?" 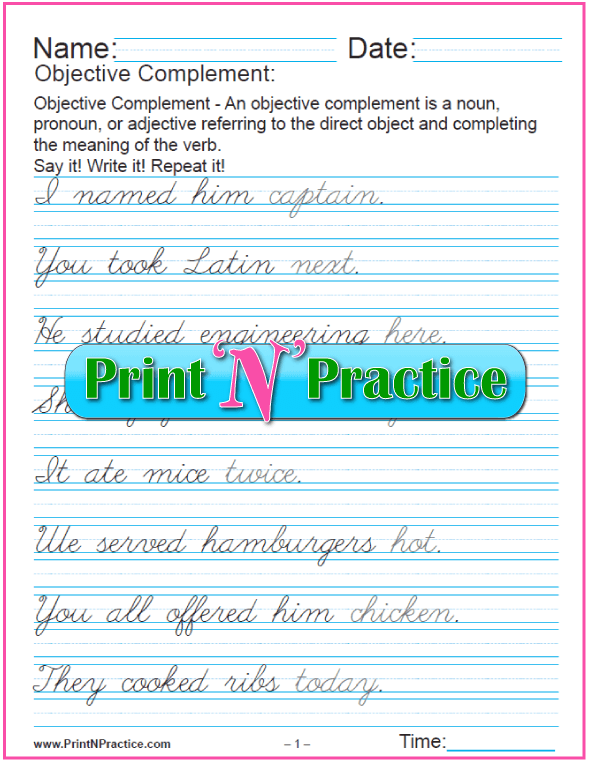 The objective case indicates that the word is a noun or pronoun is either the direct or indirect object, or an object of the preposition. The possessive case shows that a noun or pronoun denotes ownership and is an adjective case meaning that it frequently makes adjectives out of nouns. Some other languages would call this the genitive case. Apples are by the counter. "Counter" is the object of the preposition "by". Thank you for visiting our direct and indirect objects page.